The Seelie Court controls an empire of a thousand suns, each world linked to the next by the black oneirium gateways of the Sacred Guild of Gatemakers. While the empire plunders the conquered worlds to stave off its own destruction, Edenist rebels fight for independence. Caught somewhere in between is Celandine Brey, orphan, apprentice gatemaker and key to a treasure of untold wealth. Chased by imperial agents and corrupt soldiers, Celandine is aided in her quest by Mr Sukh, mute veteran of the Engine Wars, Orlando Swaan, Edenist and naïve schemer, and Ana Zanbir, a demon-hunter on the run from her husband-creator, now bound to Celandine by an unbreakable oath. 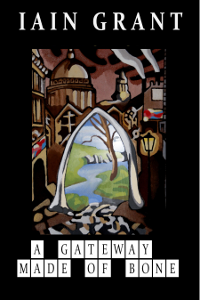 From the narcotic grasslands of Aphid to the ancient temples of Nachista, from the high-rise cityscape of Termagore to the junk world of Immonda, A Gateway Made Of Bone is a fantastic journey through the conflict and chaos of a civilisation on the verge of collapse.